Figures have appeared in textiles since at least the Egyptian’s. What’s the problem? 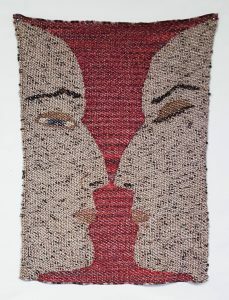 Your weavings and tapestry’s are great. They are paintings. Just not with a liquid substance. When you put your work out there, you will receive many forms of criticism’s. 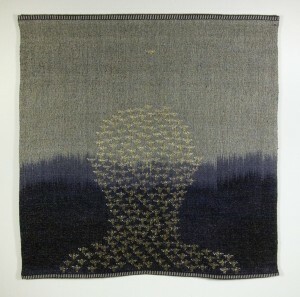 You have developed your work in textiles to a whole other level. You have taken ordinary household decor and made it into art objects, or object’s d’art. You have to be true to yourself. 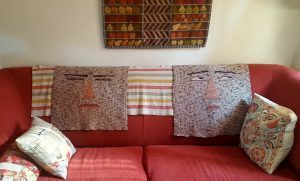 If you feel like weaving a face on a pillow, and you are pleased with it, then other’s will love it as well, but not everyone. I too try to find out what people want or like, and then if I listen to all those voices, I compromise my own sensibilities. I’ve both made work for the public, and made work for myself. The work I did without thinking about what would sell, or what would be accepted, is my best artwork. I love the two pieces that you have on this blog page. Thank you, Rita. I value your opinion as an artist and a friend. Did Picasso’s family question him after Guernica? Of the many qualities I love and admire about you is your compulsion to translate life into art. 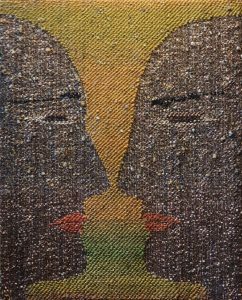 I remember your comment several years ago to the effect that stripping away embellishment to the raw basics of weaving left you feeling exposed as an artist, if I understand you correctly. I agree: we are on the cusp of unleashing terrors beyond those of WWI and WWII. Be true to your vision, Laura. Thank you, Cathy. Of course I am true to my vision. But sometimes it is rough. I have thoroughly enjoyed watching you develop the process, going from subtle to more expressive, from simple to more complex. It’s a shame that these galleries can’t support you during this exploration, but I get how much they stress over financial pressures. You will have to find new galleries that take an interest in the psychology behind the images. Do you get hyperallergic? I get their updates by email and they seem to feature a lot of work that has depth: https://hyperallergic.com/ Submit your story to them… I bet they would be interested!